President Bush said Tuesday night in his State of Union address that he wants $1.2 billion to develop hydrogen-powered automobiles. Mr. Bush said the project would promote a healthier environment and reduce the country's dependence on foreign oil. "With a new national commitment, our scientists and engineers will overcome obstacles to taking these cars from laboratory to showroom so that the first car driven by a child born today could be powered by hydrogen, and pollution-free," Mr. Bush said. 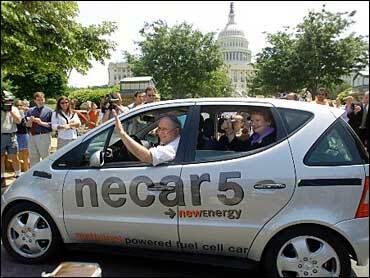 But environmentalists say that while the president's call to speed development of the hydrogen-powered cars is a hopeful sign, they view his 16-year approach as too slow to respond to pollution problems and oil dependence pressures. David Hawkins of the Natural Resources Defense Council accuses the administration of taking a go-slow approach. "We need something for the next year and the next decade to deal with our increasing oil dependence, global warming emissions," Hawkins said. The administration contends more work is needed to make hydrogen-powered cars cost-effective and it points to inadequate hydrogen storage systems, reports CBS News Correspondent Peter Maer. Every major automaker is working on some type of fuel-cell technology, which creates electric power from hydrogen and is viewed by the industry and environmentalists as a possible alternative to fossil fuels. Water vapor is the only tailpipe emission from fuel cell vehicles that use pure hydrogen. Even if gasoline or other fossil fuels are used in a fuel-cell vehicle, harmful emissions are less than those from internal combustion engines. DaimlerChrysler AG announced in October that it will offer the world's first fleet of fuel cell passenger cars in the United States and Europe this year. The company says the vehicles will not produce any smog or greenhouse gas emissions. About 60 will be available for government fleets in Europe and United States to see how they operate under everyday use conditions. General Motors Corp. has said it will gauge future investment in fuel-saving hybrid technology on consumer demand, but it plans to offer a variety of gas-and-electric-powered cars, pickups and sport utility vehicles over the next four years.